It couldn't be better! 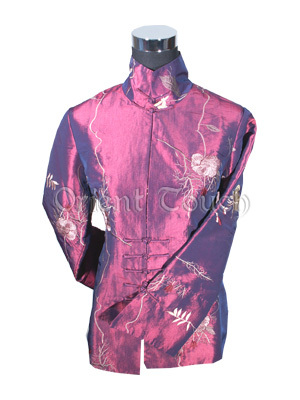 This stylish jacket is made of Thai silk. The iridescent material changes colors when viewed from different angles. Fitting-cut and embroidered with Chinese blessing flowers that add its uniqueness. A perfect way to show your neck curve with the extra stand-up collar. Designed with flare sleeves and frog fastening, it will make you more elegant and attractive!